Arrangements for the DeRossa event. Ciaran invited Gareth Bowker as speaker, flights booked. Promotion: No movement as yet. Ciaran was given several questions to ask DeRossa's office. Work out list of invitees on list. Deadline Thursday afternoon. Glenn has a registration form ready. Will be up tomorrow. Badges. Paul / Glenn have plastic holders. Ben will do template for badge. Agenda/program with abstracts from talks. Registration forms - Malcolm will make new one. General update of materials with P.O. Box number. This Friday (21st), 10am, complete invitee list and who's sending invites. Registrations & announcement on web Wednesday (19th) morning. Ciaran talking at AGM. Needs promotional materials. Registration sheets & business cards. Ben volunteers for this. In the ICS building, Sat 22nd, 3pm. Malcolm will e-mail Cultivate Centre, just a ping to see if they're interested in talking. Invite them to seminar. Can do it for 600Eur (flights & hotel). Jonas is a good speaker, will add credibility to our message. If he's busy, check for people touring Europe. Everyone in agreement re: fully funding a speaker for talk. 10:05 Intro by IFSO, giving background to IFSO and its work. 10:20 Ciaran to talk on patents, IFSO and our work on patents. 11:40 Invited IFSO speaker (Jonas Oberg). 12:20 Panel/open discussion/Q&A and wrap up. Suggestion for a "Thank you for turning up", half page blurb, half page list of resources. Ben North volunteers to look into flyers. Glenn Strong suggests setting up "Ifso-members-only" list for discussion that's not suitable for the main list. Everyone present agrees with suggestion. Glenn/Ciaran to send summary of current event situation to new list. Glenn Strong: New mailing list, conference checklist. Paul O'Malley: list of companies & contacting them. David Cathcart: speaker arrangements (flights/hotel) & refreshments at event. Mel McWeeny manned an informational stand on software freedom day at a local shopping center. Had help from local green party politician. Had four laptops showing off GNU/Linux live-CDs. Gave out 3 types of pre-prepared CDs, burned on the fly. Lots we don't like, harder sell. No consensus on where is best. David Cathcart will draft a letter to providers seeking sponsorship (bitbuzz/eircom/bt etc). To be done by end of June. Currently waiting for Vistaprint to get back re: questions about proofs. Worry about large influence pro-lobbyists have. Need to be careful - no abusive phone calls. Deluge of letters not necessarily the best idea. Need to put latest e-mail to Brian Crowley on website. Pat cox very pro patent. Note: Iona Technologies' Chris Horne made a statement about software patents effecting business, will be giving talk in September. The question was raised as to whether the northern MEPs had bee contacted. Agreement that they should be contacted in future lobbying as well as asking AFFS if they will lobbying the same MEPs. Note Belfast Lug exists, website down irc active. We should collaborate with them. Note Financial Times had an article on the Juri vote. Agreed press release on lead up to vote is a good idea. Sponsorship: ask distros (Red Hat in cork, Mandriva - Kevin Buckley contact). Agreed to decided between Beatrix and Damn Small Linux for inclusion on next CD. There was a suggestion to have a meeting of the Irish groups against software patenting (e.g. KDE.ie and various others). Glenn agreed to contact them and arrange a meeting hopefully in the next week. We are still considering publishing a glossy brochure to give to MEPs. Another group in Europe has produced one and we may have permission to make our own version of it. Apparently, this is MEPs constituency week, i.e. the week they are in their home constituencies. We decided we would try to organise people to contact them by phone. We request Ciarán to supply useful hints for doing this. The point was made that MEPs are likely to be more receptive to comments from people in their home constituencies. We need to create a guide so that people phoning MEPs "sing from the same hymn sheet". It was agreed that this should be done on the wiki. People should also read the campaignforcreativity, so as to be aware of the opposing arguments. We had the idea that a good way to counter claims that the current proposals prevent software patenting is to cite "that UK conference" (the one where "technical effect" was found to be ambiguous, can't find link). The plan was to get MEPs to "do what FFII suggest". We would also seek a firm commitment that they will support amendments which prevent the patenting of software. We decide to get "our man in Brussels", i.e. Ciarán, to find out when the next constituency week will be. There is a conference in Brussels on June 1st considering software patents. We considered whether it would be useful to send someone. No conclusion was reached. Teresa showed us her copy of Freie Software, by Volker Grassmuck. Although the book is in German, we speculated about the possibility of getting it translated to English. Glenn now has a letter from the ex-treasurer (Aiden) which will enable us to put the new Treasurer's name (Teresa) on the account. This will happen in the next week or so. Teresa asserted that she plans to supply a set of accounts for half-year of 2005 when possible. She'd said check the constitution for the requirements for publishing accounts. We have talked several times about having a conference. The possibility of hosting an existing free software conference was put forward. We would be organisers and not sponsors, of course. A good idea, we decided, would be to ask FSF Europe for suggestions. We noted that the IFSO disc is quite out of date, and needs updating. Although there is no pressing(!) need for more physical discs, it would be useful to have an image that members (and others) could access. An idea of creating a small version for easy to carry 8cm CDs. Another idea which was thought to be useful for those involved in computer science was a version of the IFSO disc with a suite of compilers on it (replacing more general purpose software). Someone mentioned the ATmission Live Disc. This was cited as having an interesting "appears writable" property. However, It wasn't clear to us whether it is comprises Free Software only. It was suggested that we have links on the website to places where people can download good free software. The Little Linux Factory was suggested as a place to find links. Mel had previously put forward the idea of a new-IFSO-member's welcome pack and this was discussed again. The idea of printing business cards was brought up. David O'Callaghan agreed to get a quote for 400 cards to be made. It was speculated that the price might approach the cost of a card printer and materials and a member might find it economical to buy one. Teresa agreed to write a letter for new members. It was noted that a short report from the attendee at the Indymedia workshop is pending. It was noted that Éibear had offered to write a short piece for FSF Europe's Press Release on IFSO's associate membership. We observed that the time for such an announcement has probably passed. 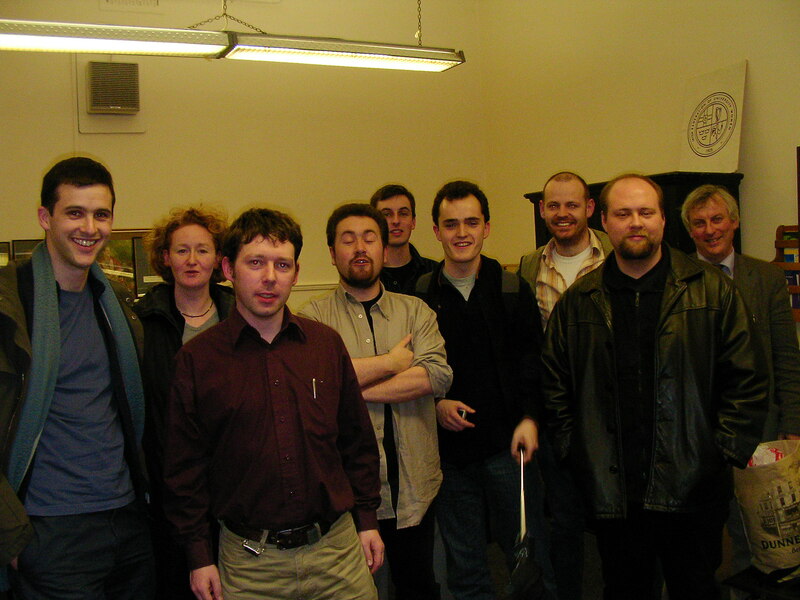 Invited to Indymedia event on 26/4/05 to talk about IFSO/Free Software. Consensus: we should do this, ask for volunteers on the list. Malcolm Tyrrell volunteers for next Indymedia event. Éibhear Ó hAnluain volunteered to draft template. Mel McWeeney suggests welcome pack for new members. IFSO shouldn't depend on a closed source application. Consensus: Use wiki page for now as trial, if popular reevaluate. Treasurer received some missing statements. Still 3 months of statements missing, order from bank. 2004 accounts were submitted to members and approved. In service. PO box 10105, Dublin 2. Plans to invest money in. (Ciarán O'Riordan). Ciarán O'Riordan working for FSF Europe in Brussels, will attempt to meet with Irish MEP's. Investigate possibility of glossy brochure. David Cathcart volunteers to price. Investigate the possibility of becoming an accredited lobbyist in European Parliament. Better links/buttons for PayPal address needed. USI have not passed motion, was not voted on. David Cathcart and Abey Campbell volunteer to meet USI Education Officer. Opening announcements. The meeting thanked Hugh Gibbons for assisting in arranging the room and Teresa Hackett for organising the meeting. The meeting then confirmed that a quorum was present. Apologies for absence were noted from Ciarán O'Riordan and Ben North. The meeting then approved the agenda. The voting procedure for the committee election was agreed. It was noted that a preferendum voting system should be considered for the next AGM; it was agreed that a simpler system could be used at this meeting. It was agreed that for the current meeting it would be sufficient to use a first-past the post system to elect one committee member, and th to repeat this process with the remaining candidates until all committee positions were filled. In the absence of the treasurer an interim report on the IFSO finances was presented by the Secretary. It was agreed by the meeting that the accounts could not be approved in the present state, as there were a number of figures that were not finalised. It was unanimously agreed that the meeting would proceed on the condition that the final accounts be circulated for approval within two weeks of this date. The subscription shall remain at ¤20 for a year, but quarterly discounts will be available. that the word "first" be struck from section 2.8 of the constitution, thus requiring the next AGM to consider the figure again. that the word "first" be struck from section 3.1 of the constitution, thus requiring the next AGM to consider the figure again. There was discussion of the draft workplan for 2005, with agreement reached as to items to be pursued. Discussion on the accounts - they accounts as circulated cannot be complete as they do not include any of the assets IFSO holds. Request an update from the treasurer. 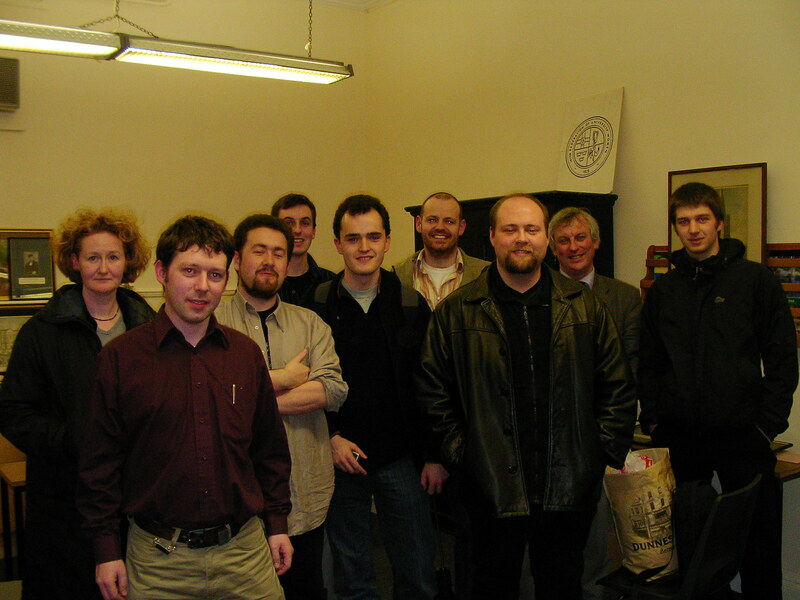 Black night solutions should be thanked at the AGM and on the web site for donating hosting during 2004. The date and time have been set as 23 March 2005, 7pm. The venue remains to be decided; Éibhear has offered to help organise this. If no suitable venue has been located by 2005 03 01 then a room in TCD will be paid for. It was noted that committee nominations and agenda items must be fixed by the 9th of March. Teresa offered to draft an IFSO work plan for 2005. It was noted that the constitution does not contain a mechanism for voting, and that the meeting will therefore have to agree one. Glenn offered to draft one for circulation before the meeting to ensure this happens smoothly. It was proposed, and agreed, that candidates for the committee should make a brief statement explaining why the members should vote for them. FSFE Affiliation for IFSO was agreed in principle. Ways to assist FSF Europe were suggested by Matthias, including proofreading of English translations. It was noted that several memberships were up for renewal and the Secretary agreed to contact those involved. Discussion of the next iteration of the IFSO live CD. Various ways the group could offer help to David in the preparation of the discs were discussed. It was agreed to ask David what kind of help he felt he best needed. Possible IFSO presence at the upcoming Linuxworld Ireland was discussed. It was decided that we would ask if any members would have days free on the dates of the conference. This is plausible as it may fall on a student holiday. Sharing some of the administrative work on the mailing list was discussed. Various small administrative tasks were agreed on: (a) adding links to the media files for Georg's talk, (b) arranging the PO box, (c) update the membership form, (d) update list membership.